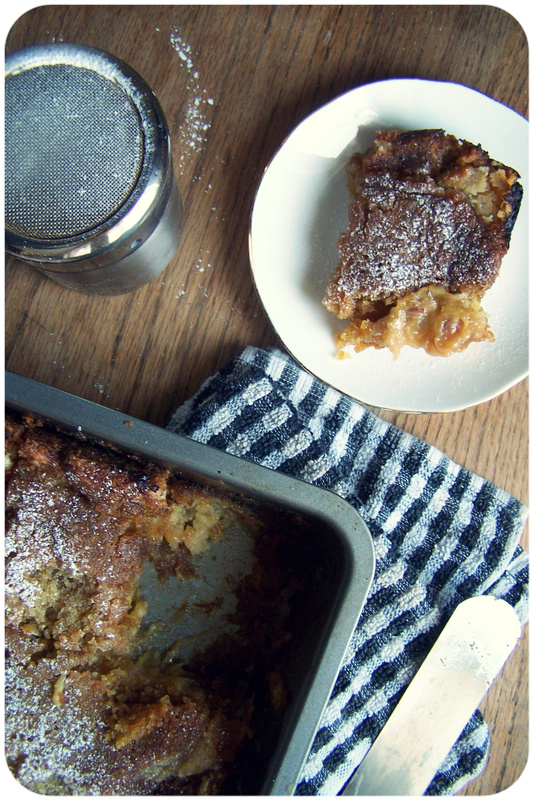 Roasted rhubarb and custard pudding slice. 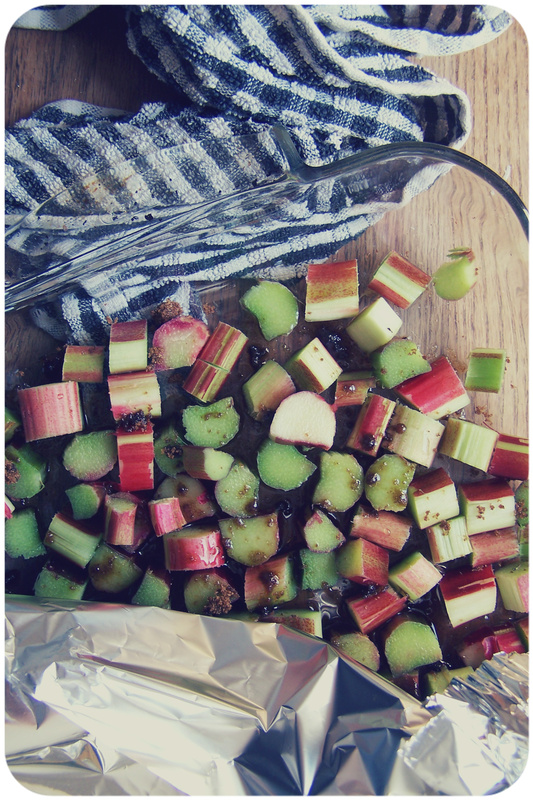 Its rhubarb time, are you guys excited? I am, we have had rhubarb in my garden since I was young. Whenever rhubarb season is here we have an abundance of rhubarb and end up making all kinds of things like crumble, rhubarb and ginger jam, rhubarb and strawberry pie, you name it we have made it in my house! 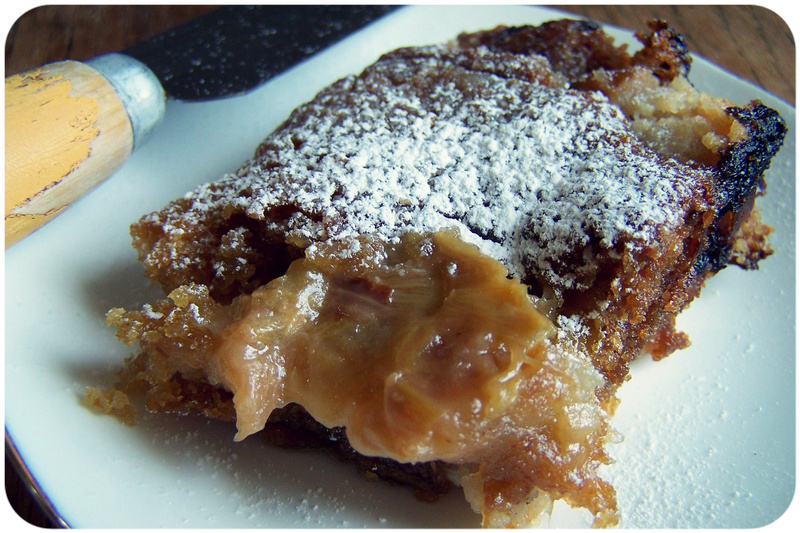 Heres another recipe to add to the pile of rhubarb wonders! I just threw this together and was aiming for something a bit more cakey but it’s turned out to be the most delightful pudding I’ve had in a long while, its comfort cake! Serve sprinkled with icing sugar and with a dollop of vegan custard, sit back and enjoy with a spot of tea or after dinner. 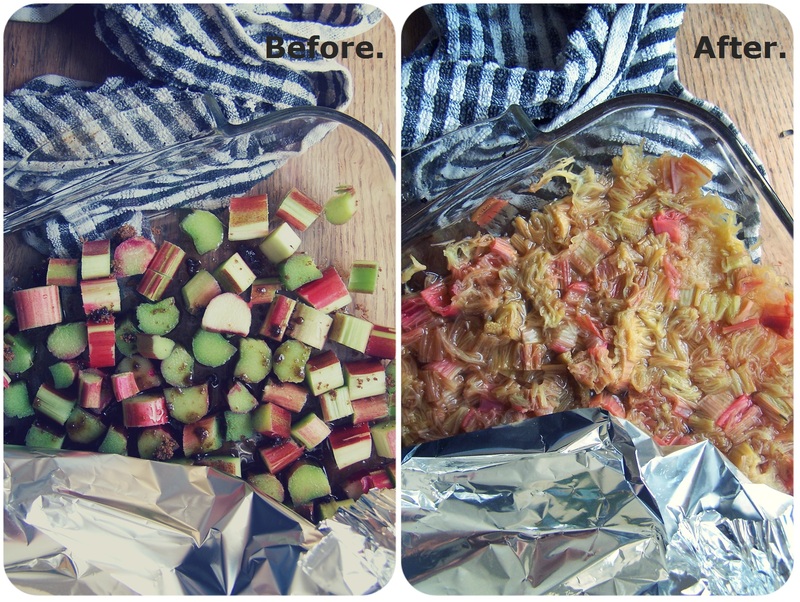 Chuck the rhubarb into an oven proof dish and sprinkle with the sugar, add the water and toss around. Cover with foil and bake for about 25-35 minutes until nice and tender. Allow to cool fully before using in the cake. 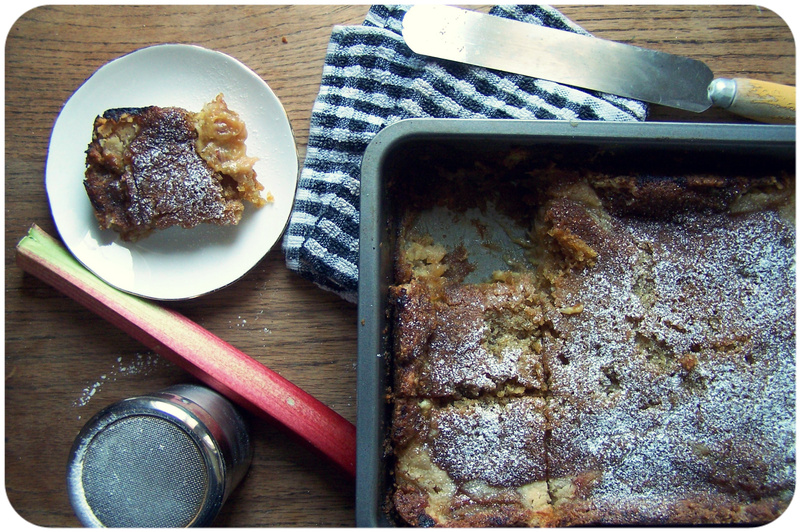 Rhubarb and custard pudding slice. Preheat the oven to 180c/360f and grease a 13″ x 9″ rectangular cake pan/brownie pan. Line the bottom with grease proof paper and dust the greased tin with a light coating of flour. Cut a piece of parchment paper the size of the tin and some tin foil large enough to cover the top of the tin and fold over the edges and set these aside for later. Cream the vegetable shortening together with the caster sugar until light and fluffy, now cream in the vanilla, flax seeds and custard. Sift in the flour, baking soda, baking powder and salt and fold together. Spread this mixture onto the bottom of the cake pan. Top with blobs of the rhubarb and custard. Pulse the topping ingredients together in a food processor and crumble over the top of the rhubarb/custard layer. Bake for about 40 minutes until the top is turning golden, remove from the oven and cover with the parchment paper and then the tin foil, folding it over the edges- you will want to wear oven gloves for this- pop back in the oven and bake for an extra 20 minutes, test with a skewer and allow to cool in the tin fully before slicing and dusting with icing sugar. This entry was posted in sweet treats and tagged food, pudding, recipe, recipes, seasonal, spring, vegan. Bookmark the permalink. Wow it looks like you did a great job! I haven’t had rhubarb since I was a little girl. I would love to try this out with apples and other fruits as well. Oooh let me know how it goes with other fruits! Wow. That crumble looks amazing! 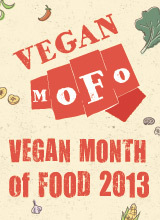 I don’t think that we can buy vegan custard here… do you know what the ingredients are? Oat or almond milk-based? I’d definitely serve this with a whole heap more custard… or possibly ice-cream of sorts. Delicious! You could make a very thick custard using birds custard powder and almond milk,you just need to make it rather thick. Mmm, this looks so good! I have only had rhubarb once, and I’m anxious to try it again this summer. I think I’ll try this soon! oh wow – this looks fab, will be trying VERY soon! How fortuitous my neighbours gave me some rhubarb yesterday! A gf version of this will be lush. Theres nothing like a bit of nostalgia, my mums been growing rhubarb since I was little, I love it!